plays the same as a commercial Celtic harp while being far far less expensive. The first one I made in three days of occasional tinkering for about $40. dulcimer that'd been laying around the garage for some 20 years. Version #2 uses a very easily made cardboard sounbox. flimsy as cardboard can be used. with the metal strings, it's much louder. These were by far the biggest expense. Pro: don't have to resort to using a tuning wrench. 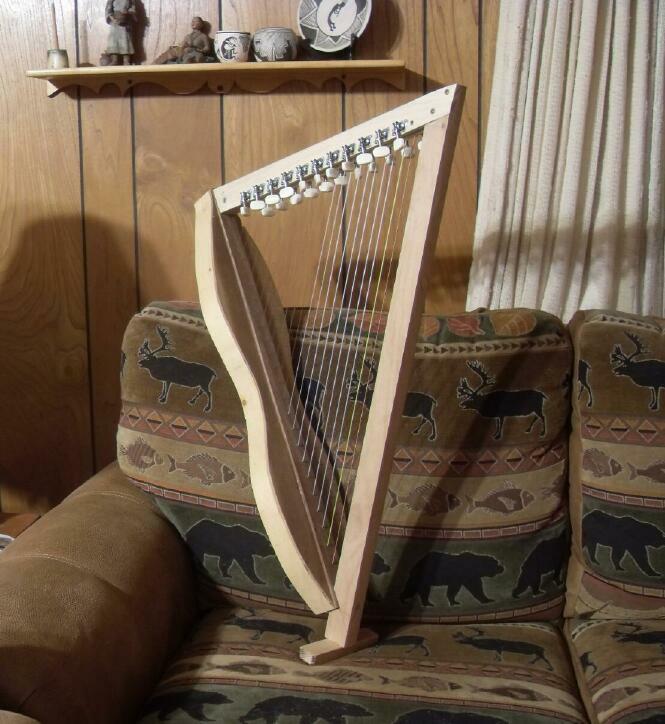 Con: the harp is noticably heavier than with tuning pins - not a problem tho. Tulip Poplar, Rock Maple and Black Walnut. Any hardwood will work fine. Making a cardboard soundbox for this harp is very simple and easy. meets the other. Furniture stores are good sources of unwanted cardboard. 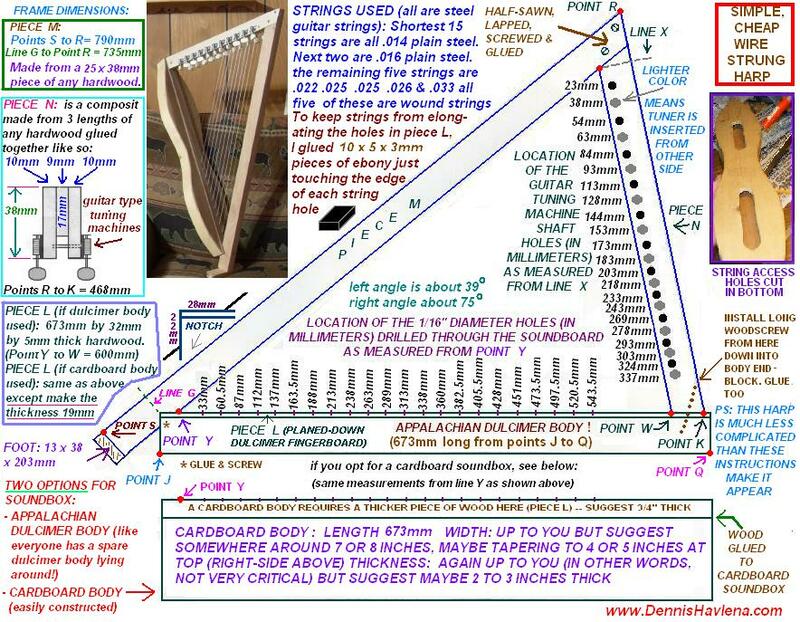 member ("Piece L") could be made the same thickness as for the "dulcimer-soundbox"
instrument -- the wooden body would easily withstand the tension. C note, two octaves above "middle C". - tune the lowest C note, then skip a string & tune the E then the G and then the B. (the tuners for C,E,G & B are all on the same side of the instrument). - tweak first octave tuning. Then proceed to the next octave (C to C) the same way as above. - repeat for the third octave. (stay in tune) far faster than nylon strings. 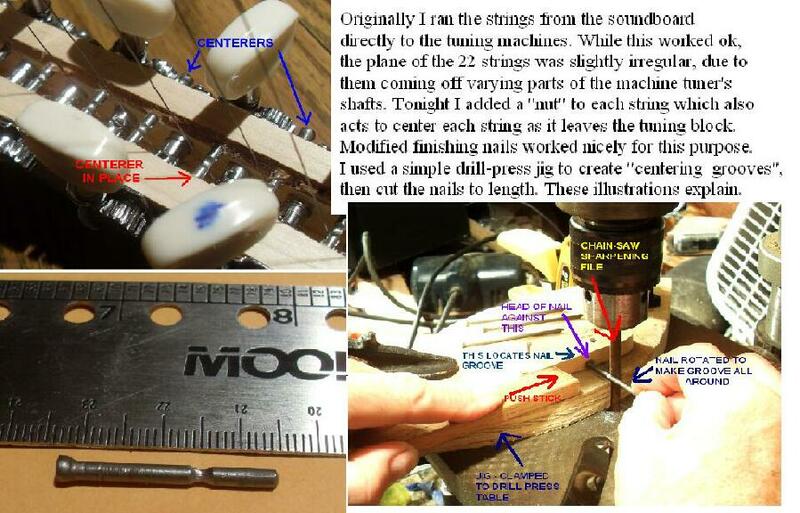 the toggles) from slipping through the soundboard holes. simple instrument, but it does serve to align all 22 strings in a nice, flat plane.